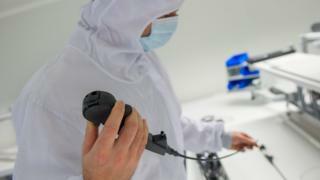 Greek police say a Colombian criminal gang has stolen expensive medical equipment from four Athens hospitals, with similar thefts seen across Europe. Swallowing small packets of drugs, then recovering them from excreta, is a well-known method used by drug traffickers. Endoscopes are often for internal examinations to check the stomach and intestines. Three Colombians aged 20, 37 and 50, along with an unidentified woman, entered Greece in May as tourists from Turkey. Using fake Portuguese passports, they rented an apartment in Athens and hired a car to visit hospitals they wanted to rob, To Vima news (in Greek) quoted police as saying. The gang left Greece on a flight to Bogota on 25 May. Greek police said French authorities had tipped them off about Colombians suspected of similar thefts at French hospitals. Do six people die for every kilo of cocaine?